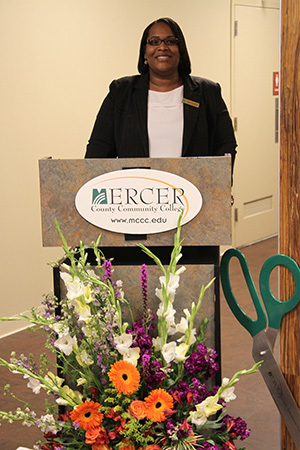 Trenton, N.J. – Mercer County Community College (MCCC) unveiled a newly renovated space at its James Kerney Campus (JKC) at a ribbon cutting ceremony on April 29. 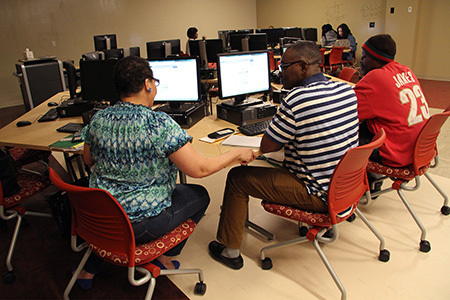 This latest facilities upgrade includes a Technology Enabled Active Learning (TEAL) classroom for math students, additional office space for MCCC's Youth College programs, and a lounge and study area. The TEAL classroom features computer stations arranged in circles, plus walls that double as whiteboards. It has been well-received by students and faculty alike. These latest renovations build upon areas of the campus that have been upgraded over the past six years including biology and chemistry labs, computer labs, a Certified Nurse Assistant lab, electronic classrooms, a student commons and the new Trenton Hall for Fashion Design. 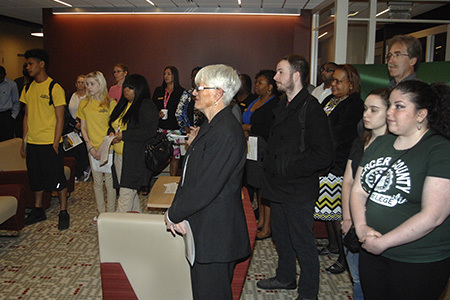 JKC Provost Monica Weaver welcomed the assembled guests, who included MCCC administrators, staff and students, as well as Trenton Major Eric Jackson and other city officials. Dr. Donohue pointed to MCCC’s Youth College programs as a mainstay of the Trenton campus. “Our youth programs have been so successful in reaching out to young people to help them develop the vision and the dream of a college education and to prepare them to move forward,” she said. Dr. Eun-Woo Chang, MCCC Vice President for Academic Affairs, noted that the current renovations are a stepping stone. “We are moving forward with new buildings and new programs that focus on innovation, technology and the arts,” he said, noting that the college has received funding from the federal government, the state and private charitable donors to proceed with facilities upgrades. Two new programs will start at the Trenton campus in the fall: Cybersecurity and Security Systems Technology. Programs in health care and the arts are planned for the future. Stacy Denton, Director of Youth College’s Upward Bound program, shared statistics that speak to student success in pre-college programs. 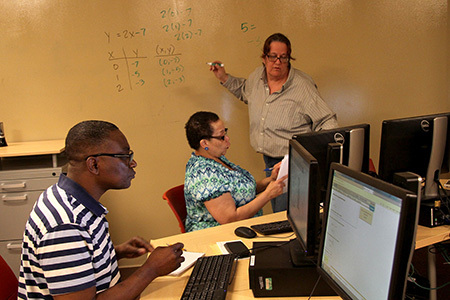 “Ninety-five percent of Upward Bound students go on to college and 75 percent earn a college degree,” she said, adding that she herself was once a Youth College student and went on to earn her associate degree at MCCC, a bachelor’s degree from Rowan University and a master's degree from Grand Canyon University. “I want the same for my students – success,” Denton said. Upward Bound Director Stacy Denton, a first generation college student, spoke of the power of education in her own life. 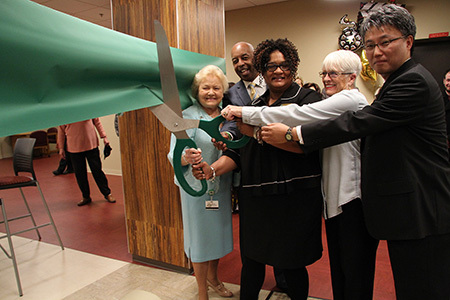 Cutting the ribbon, from left, MCCC President Patricia C. Donohue, Mayor Eric Jackson, JKC Provost Monica Weaver, Trenton Councilwoman Marge Caldwell-Wilson and MCCC Vice President for Academic Affairs Eun-Woo Chang. Attendees gathered for the ceremony in the new lounge area. Students work at their own pace with faculty support in the new TEAL lab. Professor of Mathematics Betty Peterson uses the white board wall space to provide individualized teaching. 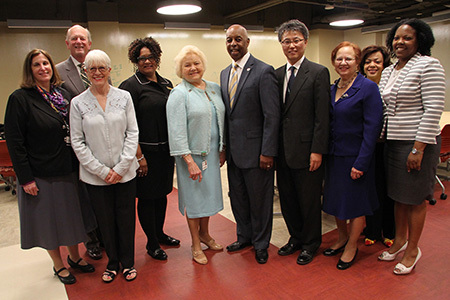 In the TEAL lab are, from left, Interim Dean of Science and Health Professions Linda Scherr, Vice President for College Advancement Ed Gwazda, Trenton Councilwoman Marge Caldwell-Wilson, JKC Provost Monica Weaver, MCCC President Patricia C. Donohue, Trenton Mayor Eric Jackson, Vice President for Academic Affairs Eun-Woo Chang, Executive Dean for Student Services Diane Campbell, Chief Operating Officer of the Henry J. Austin Health Center Renee Haynes, and HJAHC Chief Executive Officer Kemi Ali.